This day of the Lord, which is eternal brightness, appears in the heart; and the dawning and breaking forth of it is to be waited for there; and as it is witnessed, it manifests evil, and brings it to light, and declares against what is contrary to its own nature. 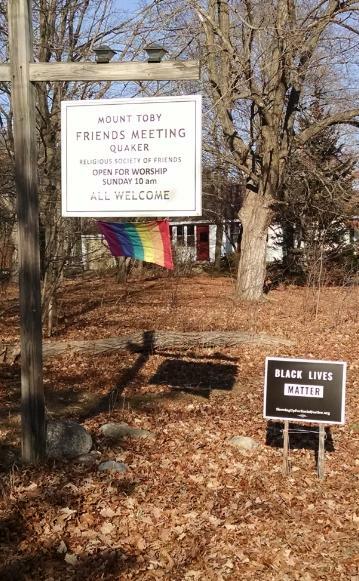 Mount Toby Friends Meeting is a welcoming faith community. We come from many different religious backgrounds, including birthright Quakers, Jews, Protestants, Catholics, Buddhists, Pagans, and those with no previous affiliation. Believing that every human being shares in the universal Light, we join together each Sunday to create an expectant silence where the spirit may enter. Our Meeting is “unprogrammed,” which means that there is no formal order of worship, but those who are moved by the spirit can speak. Thus we all are ministers as well as attenders. See also About Quaker Worship. For the past 350 years, Quakers have lived their lives in accordance with values of peace, justice, simplicity, and integrity. Today these values find their expression in environmental action, non-violence work in prisons, working with draft resisters, active engagement with our legislators in developing programs to help the poor and the oppressed, and a variety of actions to promote peace, both locally and in the larger world. See About Quakerism. We meet each Sunday at 10 AM for Meeting for Worship (see Directions), with religious education for adults at 9 AM. Visitors are always welcome. After Meeting we invite you to join us for refreshments and fellowship. Please make yourself known to others and feel free to ask questions. For more about how to participate or join in our community, see the schedule or information on ways to learn about Friends. Our Meetinghouse is completely handicap-accessible. 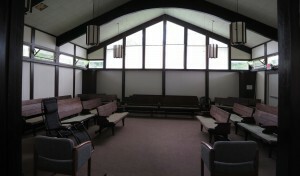 The worship room is equipped with an amplification system for the hard-of-hearing. We are welcoming and affirming to people of all races, ethnicities, and sexual orientations.